The Leong sisters – Olivia, 4, and Isabelle, 7 – read books in the tiny children’s section of the State Library of NSW. Planning for a new dedicated children’s library is underway. Credit: Nick Moir. The State Library of NSW holds the precious manuscripts and illustrations of some of Australia’s most beloved children’s authors. Conserved in its basement are original works by May Gibbs, Pixie O’Harris, Norman Lindsay, Ethel Turner, Ruth Park, C.J. Dennis, Alison Lester and Bronwyn Bancroft. But never has there been a dedicated space devoted to the best books for children and young adults by authors from Australia and overseas. At a time of booming children’s readership, the Library Foundation will this week launch a fundraising appeal to correct this anomaly, part of State Librarian Dr John Vallance’s energetic brief to widen the library’s welcome to families, researchers and scholars alike. Following the opening of the new Michael Crouch Family Galleries, the refurbished Dixson Galleries and purpose-built children’s learning Centre funded through a $1 million donation from philanthropist John B Fairfax, the library plans to open a new Children’s Library that will, for the first time, provide a dedicated area for children and families to browse the shelves, sit down and read a book. 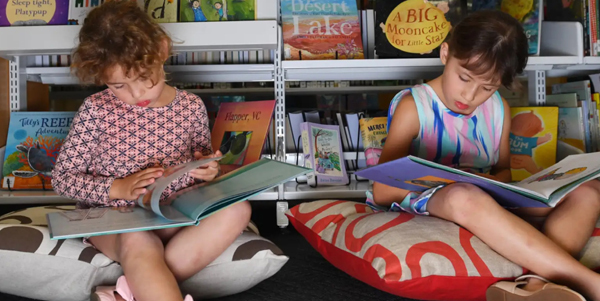 A staff training room will make way for an informal space designed around the enjoyment of reading for children aged up to 16 years, according to library manager, Philippa Stevens. The State Library will partner with the State Library Foundation to raise $300,000 for the project and is asking for public donations to meet the cost of purchasing thousands of books needed to stock the new library shelves. Resources for the new Children’s Library are to be the focus of the foundation’s annual appeal for donations. Traditionally, the State Library has not been seen as a place for children, Dr Vallance said, organised as it is around the Mitchell Library and its rare book, map and manuscript collection, and the State Reference Library, with its repository of scholarly and research sources. “While not in any way taking away from the library’s historical focus and strengths, the library is working to re-establish its relevance to the whole community and children and adults are pretty important to the community,” he said. Dr Vallance is hoping it might too become a resource for scholars, critics, and writers interested in current trends in children’s literature. A designer is soon to be appointed and the Children’s Library could be open as early as October, with a major exhibition on May Gibbs planned for later in the year. The energetic Dr Vallance’s next project is to find a way for readers to borrow out some of the latest titles in the collection books using existing library resources, not something the library has done since the 19th early 20th century (1909).